Clay hibiscus are gorgeous and can be made in a vast range of colors! The beautiful hibiscus are large ,lush show plants and transport one to tropical climes where they bloom in abundance. This arrangement of hibiscus flowers also has plumeria , another tropical flower for company. 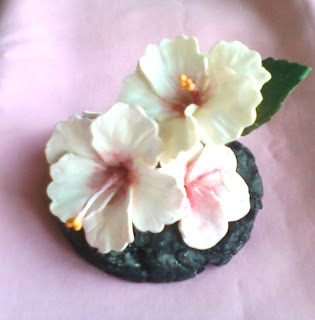 Hibiscus ,plumeria flowers also make great decoratives for boxes, place cards , wedding favors and everything else. These are simply awesome.. New to crafting with clay..